June 11, 2013 by David Shields. Average Reading Time: almost 5 minutes. On page 62 of American Wood Type 1828–19001 Rob Roy Kelly makes a passing reference to the existence of several wood type manufacturers using the name American Wood Type. Kelly’s text only detailed the one manufacturer working in the 19th century. The nineteenth century American Wood Type Co described by Kelly was founded by Charles Henry Tubbs. Tubbs left the employ of William H. Page to start his company in South Windham, Connecticut in 1879. The company changed it’s name to Tubbs & Co in 1902 and then to Tubbs Mfg Co in 1905 when Charles Tubbs sold his interests to four employees who moved the company to Luddington, Michigan. Tubbs Mfg Co was in business until 19092. There were two other companies that went by the American Wood Type name though neither were mentioned directly by Kelly. The American Wood Type Co owned and operated by Frank Gerhardt was located at 302 McDougal, Brooklyn from at least as early as 19183. Gerhardt’s American Wood Type Co operated until August 1921 when the company’s name was changed to American Brass & Wood Type. This manifestation of the company operated until at least 19254. 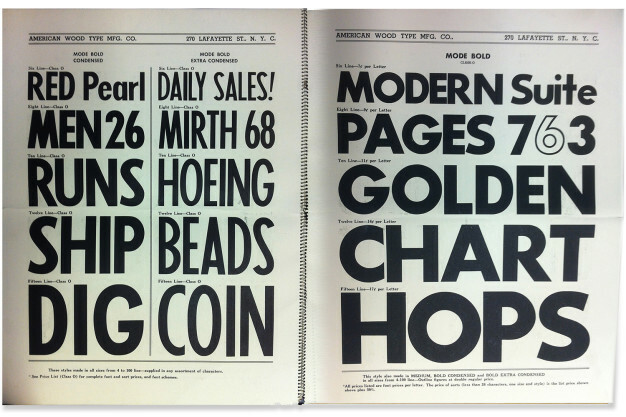 There are currently no known specimen catalogs showing this company’s typographic offerings. The third company using the American Wood Type name is generally more well known, though it was not described by Kelly but for the inclusion of two images5 from an unidentified specimen book. In 1932 Rube Mandel founded American Wood Type Mfg Co in New York City. Mandel apprenticed under a man named Rozart [sp?] in the 1920s and then acquired Rozart’s equipment and patterns in the 1930s6. American Wood Type Mfg Co would go on to acquire Empire Wood Type Co in 1936 and ACME Wood Type & Mfg Co in the early 1940s. It is not entirely clear if the purchase of the Rozart equipment was used to start the company in 1932 or possibly represents the acquisition of Empire Wood Type in 1936 or the ACME Wood Type & Mfg Co acquisition in the early 1940s. In an interview published in March 19567, Rube Mandel stated that the Empire Wood Type Co that American Wood Type Mfg Co had acquired was founded in 1850. This 19th century date is difficult to verify as the earliest known record of a company by that name indicates that it was established in 19018. The earliest confirmed appearance of Mandel’s American Wood Type Mfg Co in print is an ad in the July, 1933 issue of The Graphic Arts Monthly. The earliest known specimen catalog was published in January, 1934. This date is corroborated by an ad for the catalog in the February, 1934 The Graphic Arts Monthly. The catalog is 10½ × 14 inches with 18 spiral-bound pages plus cover. The interior is printed black on off-white uncoated stock and the cover is printed 1-color on 14-ply chipboard. An imprint on the inside back cover indicates that the catalog was bound by Spiral Binding Co, New York. 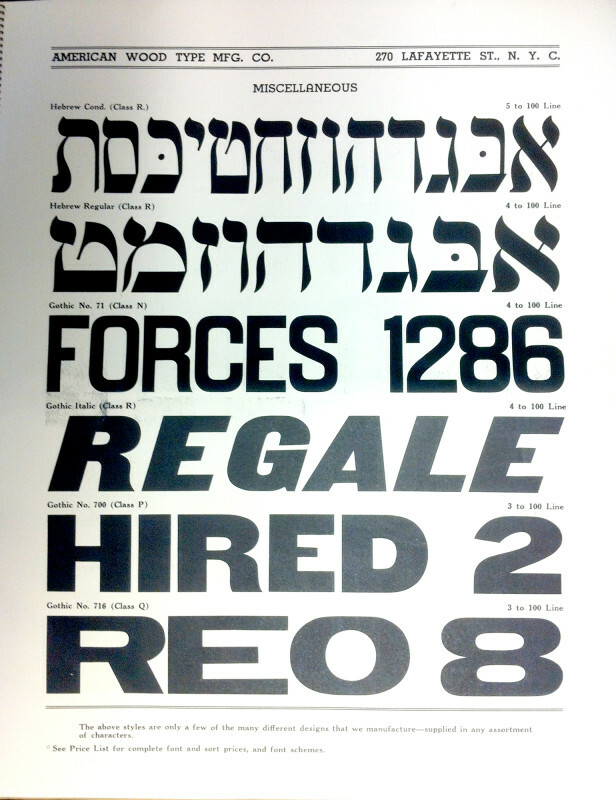 The catalog includes 26 different styles of wood type, predominantly jobbing Gothics, but also included 4 styles of Cooper, 2 styles of Rugged (their name for Neuland), a Slab Serif and Fat Face Roman as well as 2 styles of Hebrew script. Sizes shown range from 6-line to 24-line, and the price list indicates sizes could be cut to in excess of 100-line. 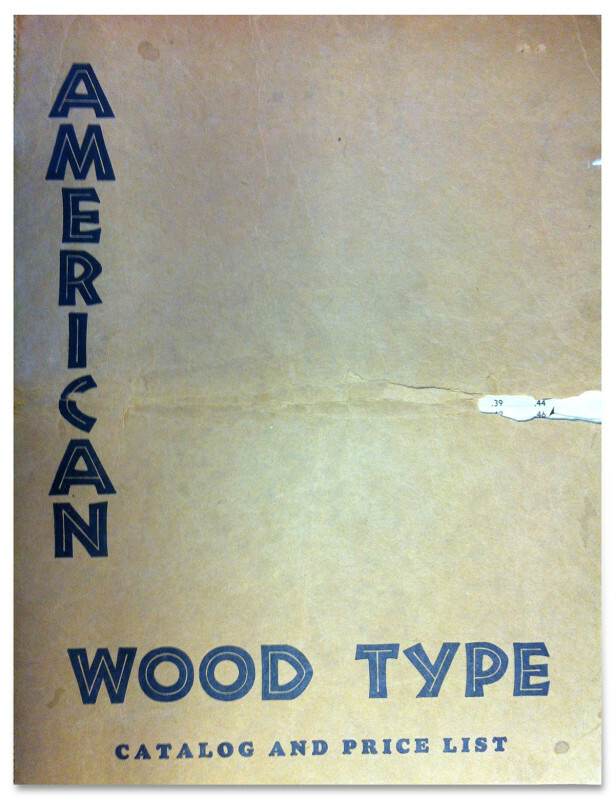 American Wood Type Mfg Co produced a number of catalogs including the 1936 Catalog No 36 and the 1939 Catalog No 39. Between 1956–2000, American Wood Type Mfg Co published a catalog of all the companies offerings in wood type and printing equipment and supplies every other year. Many of these serial publications are held in readily accessible library archives around the country. The business and manufacturing address — 270 Lafayette Street, New York City — was used at least as early as January, 1934, and was quite possibly the company’s original 1932 address. The 1938 catalog indicates sales offices also in Chicago (618 South Dearborn Street) and San Fransisco (441 Clay Street). Sometime between 1950–1952 the company relocated to 35 West 3rd Street, and late in 1958 moved again to 42-25 9th Street, Long Island City, New York. In 1963 American Wood Type Mfg Co changed its name to American Printing Equipment & Supply Co. Shortly after September, 2001 the company moved to its current location at 153 Meacham Avenue, Elmont, New York and ended wood type production. After wood type manufacturing was halted in 2001 the equipment and templates were sold off and changed hands in the early 2000s. Bill Jones traveled to Cincinnati, Ohio and bought approximately 100 crates containing original patterns for roughly 100 typefaces as well as a large pantograph9 and used this purchase to established the Virgin Wood Type Company in late 2010 in Rochester, New York10. It is believed that the balance of the equipment remains stored in Ohio and unconfirmed reports indicate that some items were donated to the Smithsonian and to a collection at Yale University.